Andy Cawood was on his mobile chasing up an order for a replacement stand-pipe. The existing one was leaking heavily, undermining the effort of the portable centrifugal pump to relieve the ever-swelling pond beside the seventh green. It was just one of the headaches the endless wave of downpours has given Knaresborough’s head green-keeper in this bedraggled winter. A newly-fitted stand-pipe would allow him to put the pump on “full revs”, expelling 1100 litres of water per minute into an underground drain that runs 300 yards into a dyke. When the pump and drainage system was installed two years ago no one anticipated that it might soon be coping with daily rain virtually non-stop for two months. On full power, it can reduce the pond to normal level within hours, but the abnormal, persistent rain has left little room in a dyke already brim full. Like most other green-keepers he’ll be comparing his headaches with others at the annual exhibition and conference of BIGGA – the British and International Golf Green-keepers Association – in Harrogate on January 19. It takes place at the Conference Centre over three days. The battling efforts of himself and his team have managed to keep open nine and sometimes 16 holes throughout much of the meteorological onslaught. Qualifying games, the formal tests of handicaps, have taken a hit, but social golf has ploughed on except in the very worst spells. Ironically, the greens have been in excellent shape for winter – the mowers were cutting them up till December 19 when the next deluge drove them off the course. The state of the course means it would be dangerous to drive mowers and other heavy machines over fairways and rough. In turn, that means that debris such as snapped tree branches, logs or other bulky items have to be moved by wheel barrows. 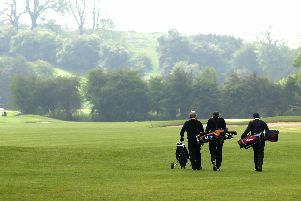 The non-stop rain has meant postponing planned parts of the winter work programme, such as pruning or removing trees , since using chain saws would be too dangerous; also on hold is the creation of a new pathway threading between the eighth green, the seventh tee and round to the ladies’ ninth tee. Yet along with the down-pours has come extraordinarily mild weather – a perfect formula for encouraging the hated fusarium disease. And instead of mechanically spraying to protect greens from fungal infection, the greens staff have had to hand spray. Fortunately, investment in more extensive drainage in recent years means that when the weather does turn for the better, course recovery should be quicker than in the past. “It’s been tough but we’re determined to present a full, playable course as soon as possible,” said Cawood.